For large beverage companies, the push into pot is all about the fear of missing out. After getting beat on trends including craft beer, coconut water, and flavoured seltzer, the drink giants don’t want to miss the next trendy ingredient: cannabis. Whether it’s the THC that gets you high or the non-psychoactive CBD, weed components are being infused into drinks with an eye toward the mass market. PepsiCo faces a struggle for growth as consumers turn away from sugary soda. Its shares took a hit recently after its chief financial officer told analysts the company had no plans for cannabis. Coca-Cola recently acknowledged it was looking at the possibility of infusing CBD into “functional, wellness beverages around the world”. The interest of Coke was more validation for the burgeoning cannabis industry, which has moved from the black market to the stock market and now appears to be on its way to the supermarket. Beverages are forecast to make up 20 percent of the market for marijuana edibles by 2022, according to Canaccord Genuity. Legal marijuana sales are expected to rise to $11-billion in the US this year, from $9-billion in 2017, and cannabis-infused beverages account for less than 1 percent of that. 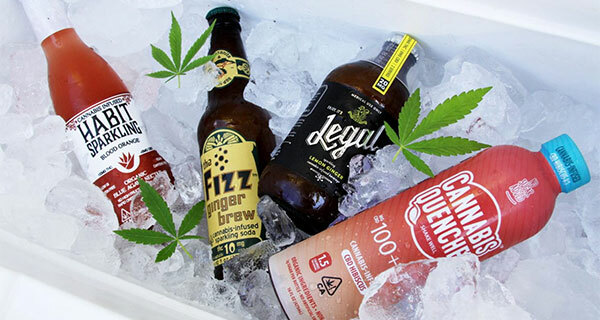 But a recent report from the bank Canaccord Genuity Group estimated that sales of drinks infused with THC or CBD, forecast to make up 20 percent of the edibles market, will reach $600-million in sales in the US by 2022. In Colorado, which became the first state to legalise recreational marijuana in 2014, sales of cannabis drinks almost doubled in 2017 and are up an additional 18 percent in the first half of this year, according to Flowhub, which tracks marijuana sales data. The current pot investment boom got started in August when Constellation Brands, best known as the maker of Modelo Especial beer and Robert Mondavi wine, plowed $3.8-billion into Canopy Growth, an Ontario-based cannabis company. Molson Coors Brewing has invested in the industry, and the liquor giant Diageo is rumoured to be interested, which has helped drive the value of at least 10 Canadian companies above $1-billion. Alcohol companies are concerned that young professionals might swap out their usual wine or cocktail for a weed beer or some THC-infused water, an idea known as the “substitution effect”. Canopy has been secretly working on cannabis drinks for the past couple of years in an area of its Ontario campus known as the Section 56 Exemption lab. It’s trying to sort out how much of it to put into beverages, how long it will take for effects to be felt, and how long they take to wear off. When Canopy was talking to Constellation about a partnership last year, it didn’t mention the project for fear that the big guys would steal the idea. Now, Canopy CEO, Bruce Linton, argues there’s a massive market for weed drinks.